I am 52 years old, and most of my life I suffered from weight issues and chronic constipation. I knew the weight could be dealt with if I chose to eat properly, but had always needed to half starve myself in order to be thin. And I just didn’t want to deal with the hunger anymore. As far as the constipation, my doctor would just recommend fiber supplements. Diet was not discussed to correct it. In 2010 I had several episodes of diverticulitis. I was hospitalized each time. Finally it was ordered that I have colon resection surgery, resulting in half of my colon (about 30”) being removed. During my recuperation, I found a few interesting documentaries on Netflix. Forks Over Knives really got me thinking. I purchased the Engine 2 Diet bookand read it cover to cover in one day! But I just wasn’t ready to change my diet yet. Fast forward to August 24, 2012. I went to see my primary care physician about some anxiety issues I was having. She was more concerned about my weight (172.4 lbs. – BMI 31.5) blood pressure (148/86). She wanted to prescribe a bunch of medications. I asked her if I could try changing my diet first. She said that was hogwash! She said at this point in my life, the damage is done. I would now need medication to control the symptoms. Remembering back to Forks Over Knives, I asked her if I could try changing my diet first, and come back in a few weeks. She agreed, but was doubtful. That night I watched Forks Over Knives again, re-read the Engine 2 Diet, and found Happy Herbivore and Plant Based Adventures [Editorial note: this blog is managed by former Herbie of the Week, Ami!]. I was determined to give this lifestyle an honest try! And I will have to say, that all the information I found from these people and their websites, blogs, books, etc. have saved my life! I started a 28-day Challenge the very next day and never looked back! Over the following 4 months I lost 45lbs (I’m 5’2”, went from 170lbs to 125lbs) without needing to increase my exercise regimen (walking 1-2 miles/day). My blood pressure dropped, as did my cholesterol and triglycerides. But most important, I no longer suffered from constipation! I went regularly and daily! I had my first follow up with my doctor on October 4, 2012, and my weight had already dropped to 153.2 lbs. (BMI 28), and my blood pressure was 128/76. My doctor even wanted more information on my diet so that she could tell her other patients about it! But she still wanted another follow up. So on January 10, 2013 I went to see her again. Weight was 133.8 (BMI 24.5) and blood pressure was 112/66. No need for medications! And from there I have stabilized at 125 lbs. (BMI 22.9) and feel GREAT! Then in March 2013 I found out I needed surgery for some incisional hernias resulting from not healing properly from my colon resection surgery (a consequence of my previous poor nutrition). I was hoping that my healthier body would result in a faster recovery from surgery. And I was right! I had no complications, healed very fast, and was able to return to work 2 weeks sooner than the surgeon had expected. Everyone that saw me during my recovery could not believe how quickly I healed! I had very little pain, felt great, and couldn't wait to get back to work! And this wasn’t laparoscopic. They had to open me back up the full length of my original incision (I had 32 staples!). 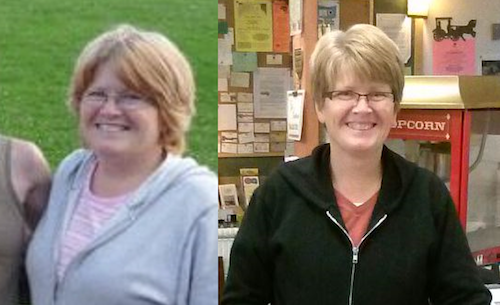 My family, friends and co-workers have seen the changes in me and many have asked how I lost all this weight. I tell them I eat plants! (This answer usually brings up more questions, which then allows me to explain further!) Two of my co-workers have also started following this lifestyle, as have two of my friends. So thank you Lindsay, Rip, Dr. Campbell, Dr. Esselstyn and Ami for saving my life! Thank YOU Peggy for so bravely sharing your story! Wishing you much continued success! I have maintained my weight loss for over a year now, and I am so much healthier! My last blood work showed that my cholesterol has dropped from 235 (before the diet change) to 165! And yes, that is by diet alone…no drugs at all!